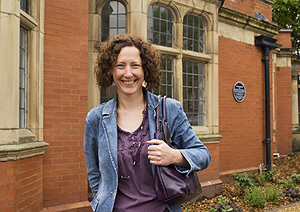 The concept of the Reading With a View garden was born in 2008. The original idea, which has now been realised, was to transform the existing green space around the library into an area fit to be used by the community for reading and communal activities, and as a place where people could simply relax and enjoy the garden. 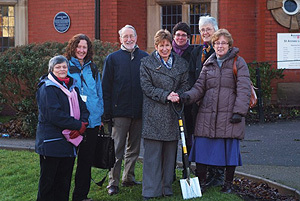 The Friends of St Annes Library took on the project, secured the funding and saw it through to completion. 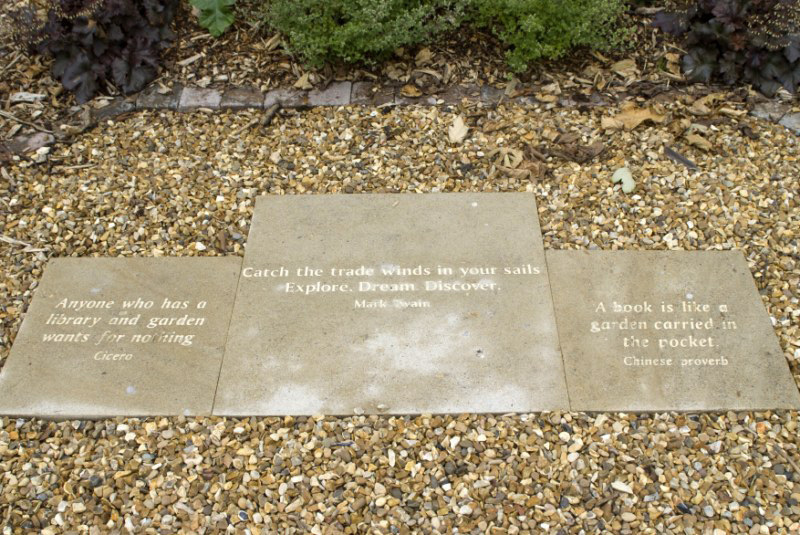 How did this idea for a reading garden blossom into a reality? Well with a lot of help from various funding bodies, a very sympathetic garden designer, lots of awareness raising events organised by the Friends, and feedback and support from the local community. Gabbie came up with two draft designs, from which the Friends selected their favourite. We sought the views of the community which were then incorporated into the final design. The plan was made available in the Library for the public to see. In October 2010, we finally received confirmation that our application to Big Lottery’s Community Spaces scheme for funding towards the garden, had been successful. Together with the funding already granted by the Lancashire Environment Fund and funds donated by library visitors, we had reached our target of £57,000, ensuring that the dream could definitely become a reality! Gabbie Nickson agreed to be serve as project manager during the implementation of the project. 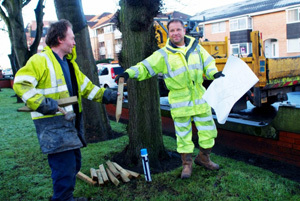 Contractors started work in January 2011 and despite the hard winter didn’t fall too far behind schedule. As the Reading With a View Garden launch drew nearer the Friends worked hard, assisting with planting and more, to ensure the garden looked as finished as possible for our 7 May opening! The people of St Annes who have donated most generously. 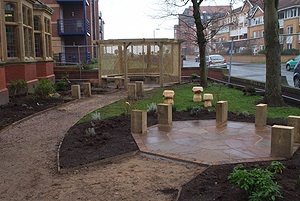 The side garden features a pergola, which has a storyteller’s chair and a seating area, which can be used by the Library to provide story sessions for the young and a reading area for older groups. This area also has benches arranged along a pathway that has been specially laid for ease of use by people with disabilities and wheelchair users. The Lancashire-based sculptor Thomson Dagnell was commissioned to create a sculpture for this area of the garden. The garden in front of the library offers a number of tables and benches for everyone’s use, and an open area, which can be used for community activities for adults and children. The planting incorporates season and sensory varieties, and also features two solar-powered steel spheres, out of which recycled water bubbles up and out and over. 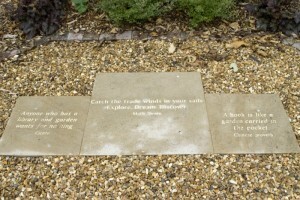 Surrounding the water features are flagstones carved with quotes provided by the Library’s various reading groups. The Friends of St Annes Library are very proud of this beautiful garden, which complements a fine Carnegie library building. It provides a lovely and pleasant space for the local community and visitors to use and enjoy. As part of the Reading With a View project, the Friends of St Annes Library commissioned North West sculptor Thompson Dagnall to create a sculpture which would make use of natural materials, be in keeping with the historic context, be able to stand up to the gales that come off the Irish Sea, and to include a degree of interactivity. When one of the elm trees in the Library grounds was found to have Dutch Elm Disease, the Friends and the Library had to take the regrettable decision to have it felled in order to conserve the remaining trees. Thompson specialises in carving timber and thought that, once it had been expertly treated to remove the disease, he could use the felled tree to create a piece for the children’s reading area. The resulting sculpture certainly meets the brief and brings the tree back to its original home. The sculpture has been shaped from a single section of the tree. Rising up and spreading out from the trunk is an open book into which are deeply inscribed the words, ‘There is no them, there’s only us’ The book’s pages fold back poised, like the wings of a bird about to take flight. 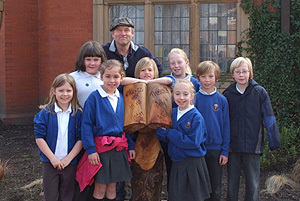 A group of students from St Thomas’ Primary School recently met Thompson in the Library garden to talk with him about the sculpture. 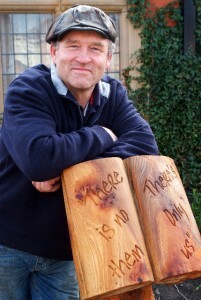 The children immediately commented on the phrase carved into the wood. The sculptor explained that for him the words meant that all the division in the world was artificial and that really everyone on the planet is the same. He said, ‘We’re all one people; we’re all human beings. And this is my anti-war piece.’ Given where they were, there was general agreement that depicting a book was fitting. Thompson went on to explain that the book was open to indicate the life in it, because ‘books aren’t just bits of paper; they come alive in your mind’. The sculpture also provided inspiration for the design of the Friends of St Annes Library logo, which we are now using on all our posters, correspondence, etc.